With no baby in sight, we headed to the pumpkin patch on Saturday. This particular place is set up like disneyland the fair. It is a little bit over the top (wristbands for all day fun!?!) but we had a good time non-the-less. Connor got to ride on a train, which he was really excited about. Once the train started moving, he literally sat frozen. It was kind of funny. 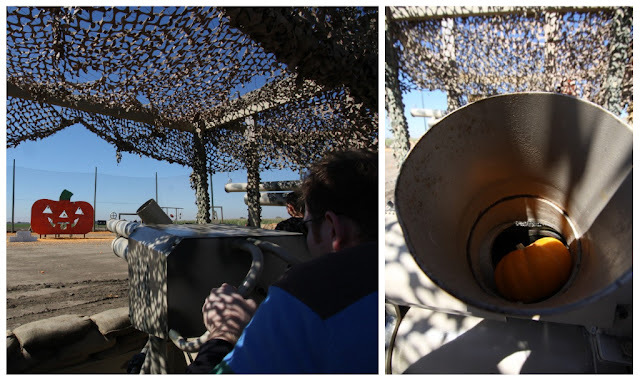 Ian got to enjoy himself shooting pumpkins at 100mph with the pumpkin blaster. And I will say, I think that was the coolest thing at the place. It kind of makes me want to go back just to do it again. (It helped get out some of the pregnancy rage...) There were different targets to hit, but the most satisfying thing for me to hit was the cars they had in the field. It was pretty cool. Connor wasn't into the pumpkin blaster at all. I think it was a little too noisy for him. So he stayed a safe distance away with my mom. We did take him up to the gun once and tried to get him to push the trigger, but he just wanted to cover his ears. 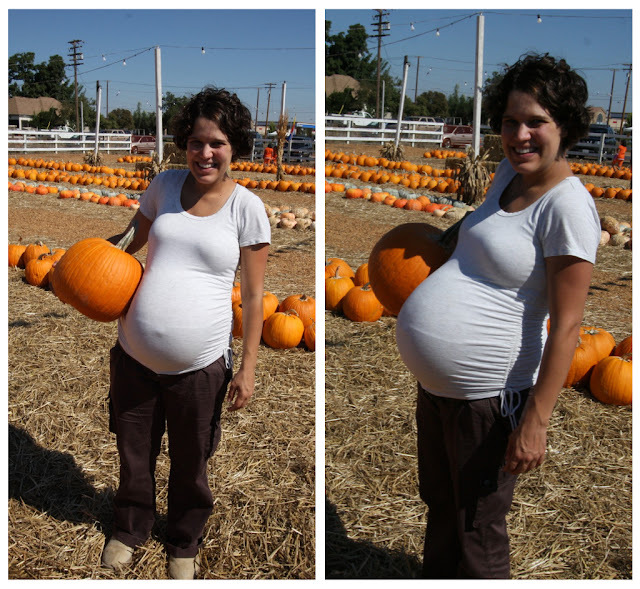 And, we had to do a belly shot with a pumpkin. My mom said I needed a larger pumpkin, but given that I am hoping the baby is on the smaller size, I chose a smaller pumpkin. Wishful thinking, right? And now my porch is all decorated for fall. In a couple weeks we will carve the pumpkins, but for the time being, they make cute porch decorations just as they are. 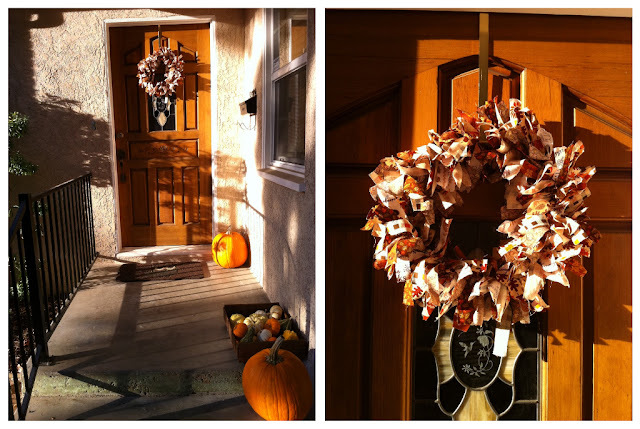 And in case you care, I stole a friend's idea and made myself the fall wreath on the door. But because I was lazy and didn't cut my fabric strips down (I just left them the size of the fabric I purchased...1/4 a yard...9 inches...I am sure you really wanted to know this!) I think it makes my wreath look a little droopy. Oh well. I still feel accomplished to have made something AND to have actually decorated my porch for fall. So, go me! Heeeeyyy! There weren't any pumpkin guns where I went! No fair. I really, really especially like your hair in this post. And the white shirt. And the pants. Cuuuuuute. I think your wreath looks lovely just as it is. Your wreath looks really good!!! Looks like you guys had a great time at the pumpkin patch. I'm praying that this baby makes it's appearance very very soon.